We’d love your help. Let us know what’s wrong with this preview of Zola's Elephant by Randall de Sève. To ask other readers questions about Zola's Elephant, please sign up. A sweet story with Zagarenki’s truly magical illustrations. I love the illustrations in this one. The story is about making new friends. I enjoyed exploring the details in each image. A lovely little friendship/mystery story. The narrator can't be friends with new neighbor Zola, because Zola is just having so much fun with her elephant (what else could be in that big box?). Pamela Zagarenski's illustrations are, as always, layered and detailed and glowing with color. Zola's Elephant by Toy Boat author Randall de Sève and illustrated by two-time Caldecott Honor winner Pamela Zagarenski opens with our young narrator telling readers about "a new girl next door" named Zola. The child tells us that while their respective mothers have "decided we should be friends", the appearance of a big, big moving box has convinced the narrator that "Zola already has a friend": an elephant! While the narrator is convinced (and keeps trying to convince the reader!) 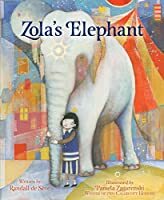 that Zola is absolutely having a grand time with her elephant- imagining Zola making the elephant toast, them having a bath, or playing hide-and-seek- readers see Zola's actual, much more muted world. A world that sees Zola next door, by herself, washing dishes, lying on moving boxes as adults stumble with boxes, holding her hands up to her ears to quell the noise of hammering, and appearing a little bit lost, a little bit lonely. As Zola's neighbor imagines an increasingly vibrant, rich and impossibly wondrous life that Zola is having with her elephant, our narrator makes the pivotal, arguably brave decision to take a walk over to Zola's house and introduce herself. Zola's Elephant is a terrific, nuanced exploration into the heartache and realities of moving and of the worries involved in taking those first steps to begin a possible friendship. Fans of Zagarenski's critically-acclaimed picture books (and of her immediately recognizable, old-world yet modern style) will likely love poring over the gorgeously detailed, layered and fabulously fanciful illustrations accompanying de Sève's tender, hopeful and beautiful story. First sentence: There's a new girl next door. Her name is Zola. I know because our mothers met this morning and decided we should be friends. But Zola already has a friend. I know because I saw the big box. Premise/plot: In Zola's Elephant, a little girl's imagination gets carried away. She imagines that the girl next door, Zola, has an elephant. She imagines ALL the things Zola and her elephant are doing in their new home. Readers, however, know the truth. There is no elephant and Zola is lonely First sentence: There's a new girl next door. Her name is Zola. I know because our mothers met this morning and decided we should be friends. But Zola already has a friend. I know because I saw the big box. 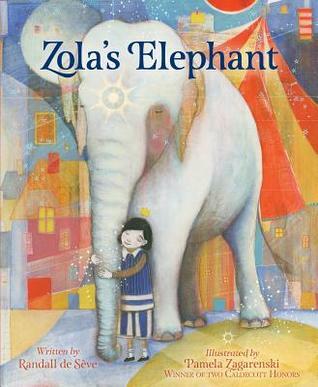 Premise/plot: In Zola's Elephant, a little girl's imagination gets carried away. She imagines that the girl next door, Zola, has an elephant. She imagines ALL the things Zola and her elephant are doing in their new home. Readers, however, know the truth. There is no elephant and Zola is lonely. Will she make a new friend? My thoughts: I have mixed feelings on this one. On the one hand, I'm thinking DON'T TEASE ME WITH ELEPHANTS WHEN THERE ARE NO ELEPHANTS. If a book has the word 'Elephant' in the title and shows an elephant on the cover, I am going to expect an elephant. On the other hand, it is a nice enough book that celebrates friendship and the imagination. A perfect pairing of text and those always magical illustrations by Pamela Zagarenski. A girl invents a story about her new neighbor—she believes she has an elephant and thus is not in need of a new friend. Beautiful and sweet! Full of opportunities for inference. In this exceptional picture book, Zola moves in next door to a little girl. The two mothers have already met and decided the girls should be friends, but the little girl knows that Zola already has a friend. After all, Zola has a box large enough for an elephant and the girl knows that elephants make wonderful friends. As the girl heads different noises, she also thinks about the fun that Zola is having with her elephant. They are taking merry baths together, playing hide-and-seek, and building In this exceptional picture book, Zola moves in next door to a little girl. The two mothers have already met and decided the girls should be friends, but the little girl knows that Zola already has a friend. After all, Zola has a box large enough for an elephant and the girl knows that elephants make wonderful friends. As the girl heads different noises, she also thinks about the fun that Zola is having with her elephant. They are taking merry baths together, playing hide-and-seek, and building a lovely clubhouse together. But the truth is shown in the illustrations, explaining the noises that are being heard as much more mundane and downright lonely. Will the little girl have the courage to head over and meet Zola for real? The text here is rich and evocative. It displays the wealth of imagination that the nameless narrator has as she builds entire worlds of play and merriment from seeing one large box and hearing some noises. It is a book that explores shyness and loneliness and how they live side-by-side and how they can be fixed by one act of bravery. Beautifully, the lonely new neighbor’s pages have no words on them, allowing the image to simply tell the truth. With illustrations by a two-time Caldecott honoree, the illustrations are detailed, deep and beautiful. Zagarenski manages to create two parallel worlds, one of imagination and brightness and the other stark and blue with isolation. She then captures the moment when those two worlds meet. Done with a circus theme that is embedded in all of the illustrations, she pays homage to the elephant fully even though it doesn’t actually exist. Note: School Library Journal recommends this book for pre-school through grade 2. The illustrations are lovely and are symbolic of the feeling children often feel when they deal with changes in their lives. Given this depth, I would recommend that it is read in small groups or one-one-one. Illustrated by two-time Caldecott-honor winning artist Pamela Zagarenski, this tender, witty friendship story of imagination gone wild, by New York Times bestselling author Randall de Sève, shows how as Note: School Library Journal recommends this book for pre-school through grade 2. The illustrations are lovely and are symbolic of the feeling children often feel when they deal with changes in their lives. Given this depth, I would recommend that it is read in small groups or one-one-one. Illustrated by two-time Caldecott-honor winning artist Pamela Zagarenski, this tender, witty friendship story of imagination gone wild, by New York Times bestselling author Randall de Sève, shows how assumptions often cause us to misjudge and miss out. But with a little courage, new opportunities and new friendships can be made. When Zola moves into the neighborhood, her new next-door neighbor is too shy to go over and introduce herself. Plus, Zola already has a friend to play with--an elephant! What we imagine is not always true, as the little girl discovers. Luckily, she also discovers that being brave can lead to new friendships and even richer imaginary worlds in this heartwarming book about friendship, moving, and the power of imagination by New York Times best-selling author Randall de Sève and Caldecott Honor-winning illustrator Pamela Zagarenski. Subject: Friendship -- Juvenile fiction. A sad lonely little girl notices something new going on in her building. A new family is moving in and they have a little girl her age, named Zola. This lonely girl takes bit of things she see’s and hears and imagines a plethora of reasons why Zola would not need or want her as a friend. Eventually Zola comes to her. Mostly it has to do with the idea that Zola must have moved in with her pet elephant. Large bright illustrations of Zola’s imagined life are interspersed with the lonely girls very blue, sad, and empty life. This book was sort of sad and depressing. The little girl never did get up the pluck to meet Zola –in fact Zola had to come to her. I like the idea of a big imagination, but the rest was so blue and sad that it was kind of cold and off putting. Normally this is one of my favorite illustrators, but the circus like clown theme was not great. The cover does have appeal though- it actually bright and gorgeous. Readers of any age can relate to sitting alone, sure that everyone else is off having fun without you, rather than just going and introducing yourself. In Zola's Elephant, that universal sentiment makes an utterly unique picture book. It is the story of a girl with a big imagination, and how she finally builds up the courage to go next door and make a new friend. The main characters voice is so vibrant and compelling, and is then juxtaposed with a wordless pages that make both the words and the Readers of any age can relate to sitting alone, sure that everyone else is off having fun without you, rather than just going and introducing yourself. In Zola's Elephant, that universal sentiment makes an utterly unique picture book. It is the story of a girl with a big imagination, and how she finally builds up the courage to go next door and make a new friend. A new neighbor named Zola has moved in next door. The other neighbor sees a big box being moved and immediately dreams it is an elephant. Noises and smells are noticed from next door and are thought to be related to Zola's elephant. At the end, the neighbor goes next door to Zola's house. There is no elephant - just new friends. This is a brightly-colored story filled with imagination. The storyline is cute and clever. Gorgeous gorgeous illustrations and a celebration of imagination and being brave enough to take the first step. I especially enjoyed the contrasting pages showing what one girl thought was happening and then what was actually happening. The puzzle of the big box was a fun addition too. The experience of being reluctant to make that first approach to a new child is a universal one and the rewarding new friendship is delightfully depicted. This is a really felicitous matching of author, illustrator Gorgeous gorgeous illustrations and a celebration of imagination and being brave enough to take the first step. But at any rate, I didn't really think it was all that "funny" that the narrator didn't want to go make friends because Zola doesn't neeeeeed friends because she's busy having all this fun with her elephant. I'm *very* glad the two do eventually meet. The text and illustrations blend together to create this story. A new girl moves in next door. The other girl wants to go over but has a vivid imagination about her life with her pet elephant - the only thing that could come in the huge box. The contrast between the bright colored imaginative pages and the reality of Zola's life are terrific. She finally goes over and discovers what's truly happening in the move. They become friends and set off together with their imaginations. —between the narrator (who is sure that her new neighbor doesn’t need a new friend because she already has an elephant for a friend) and her new neighbor, Zola. The whimsical illustrations paint 2 very different pictures of what is going on in each girl’s mind. Lovely message about friendship. There are lots of picture books aimed at the kid who has to move, this one is from the POV of the girl who has a new neighbor move in. She must not really want her to come over, as she already has her own elephant to play with, right? Lots of details to pore over, and the imaginative misconception can lead to lots of discussions (an hopefully, empathy). The illustration style isn't my favorite, but I really liked the story--how the narrator imagines all the fun her new neighbor Zola is having with the elephant that is the only thing that could be in the giant box that arrives, contrasted with the not-so-fun things Zola is actually doing. Happily, the two finally meet! This is better left for everyone to read and be pleasantly surprised. It will be grand to read aloud to a group of young readers, to celebrate and love Pamela Zagarenski's fabulous illustrations and the way Randall de Sève takes a few words, building the suspense to see Zola's elephant. I enjoyed it very much. In the course of flipping through this, the picture of Zola at the sink looking oh-so-lonely stopped me in my tracks and made me go back and read it thoroughly from the beginning. The story itself is okay, but the illustrations are *very* effective at presenting the contrast between imagination and reality. If you need a book about moving/changes and friendship this might be it. The message is very subtle and I think students will pick it up if you do not tell them what it is about. The artwork is very well done. A wonderful picture book to share with your little ones. A little girl imagines that her new neighbor Zola is too busy with her elephant to spend time with her. A beautifully rendered story about imagination and friendship. Recommended! Zola moves in next door and a little girl is convinced that she has an elephant. Zola and the Elephant do everything together so Zola won't have time for her next door neighbor. But to her surprise, Zola knocks on her door and a new friendship begins. Beautiful story about our misperceptions of others and how important it is to reach out to each other. A wonderful story to teach children about courage and compassion. And the illustrations are gorgeous! A girl watching new neighbours move in next door, imagines the new girl - Zola - is busy with her pet elephant, so it's not a good time to visit. When she finally gets up the courage to visit Zola, she finds out something wonderful. Elaborate and colourful illustrations.